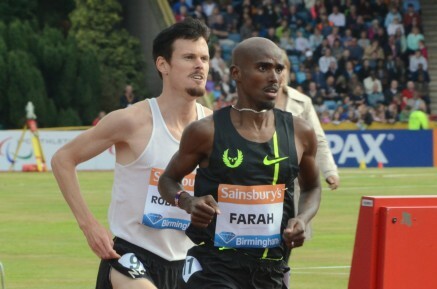 24th August 2014 – Fresh off the back of his double gold at the European Championships Mo Farah (GBR) made it the perfect homecoming at the Diamond League meeting Birmingham. Running in the 2 miles event Mo had his eyes on Steve Ovett’s British Record that had stood at 8:13.51 since 1978. However, as the race unfolded it was clear that not only was British record under threat but the European one as well. Passing one mile in 4:07 the pacemaker took Mo for one more lap and then it was down to him. Mo continued to up the pace and reeled off the last 3 laps at 60.9, 60.0 and 57.1 crossing the line in 8:07.85 to break both records. Running under distance for him Emmanuel Bett (KEN) gave a good account of himself to take third. Another PACE athlete who appears to enjoy running in the UK is Kemar Bailey-Cole (JAM). Having already won both the Diamond League meeting and Commonwealth Games in Glasgow, Kemar made it a hat-trick of wins in the 100m here. Pulling away from the field over the final 20m he timed 10.08 seconds. Making it a hat-trick of wins for PACE athletes on the day, current World Champion Christine Ohuruogu (GBR) gave the home crowd another example of her strength over the final 100m. Entering the straight in contention but probably in third place Christine overhauled the leaders to take victory in 51.40 seconds. There was a strong run from Vincent Kibet (KEN) as he took third in the mile in a personal best time of 3:52.15. In a very competitive race Matthew Centrowitz (USA) timed 3:53.46 for ninth. 3 days earlier at the Diamond League meeting in Stockholm, Oregon Project team mates Galen Rupp (USA) and Shannon Rowbury (USA) both took fourth places in their respective events. Galen ran 13:05.97 in the 5000m and Shannon 4:02.96 in the 1500m.